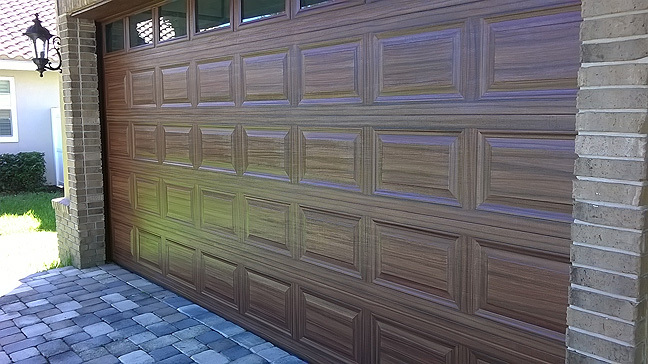 "To have your garage door look like the richness of a real wood door enhances the appeal of your entire home and wins the admiration of the whole neighborhood." When you drive through any neighborhood typically the largest architectural feature on any home is the garage door. Having your garage door look like real wood is very popular and for a good reason, it really does achieve a big uptick in the appearance of your home. 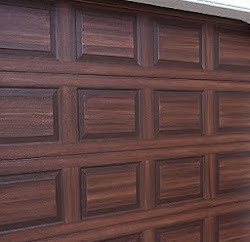 But like anything else there are the correct ways to achieve this look for your garage door for long lasting enjoyment. The garage doors in the photo above where white before I painted them to look like wood. It is so easy to do the job right. Just use a premium quality exterior acrylic house paint and you will get long lasting durable results. I paint your standard white steel garage door to look like wood for a living. I have been creating a wood look on garage doors for 10 years now. I have researched how to go about it before I started and actually called the three biggest manufacturers in the country of garage doors and talked to their technical departments. They all have told me the same thing about their garage doors. You can paint them as long as you do not use an oil or solvent based product. Period. It will void the warranty on the door. If you go on any of the major manufacturers web site and search for information about painting their standard steel garage doors this is what you will find. Can I paint my Clopay garage door?Can I paint my Clopay garage door?, Clopay's steel garage doors can be painted with any high quality exterior latex paint. Do not use an oil based paint. Amarr manufactured steel doors are pre-painted with a factory-applied finish that is suitable to be repainted with a wide variety of 100% acrylic exterior grade latex paints. From Wayne-Dalton, IF APPLYING CLEAR COAT: An exterior, water-based, satin finish clear coat IF PAINTING: An acrylic latex, satin exterior house paint (solvent-based paints are not recommended). Overhead Doors - After the surface has been properly prepared it must be allowed to dry thoroughly, then coated immediately with a premium quality latex house paint. Follow the paint label directions explicitly. Do not use oil base paint, this will void the warranty. I have added the red to highlight the important part of the painting information. The first garage door I painted to look like wood was in 2006 and it still looks good today because I followed the manufacturers instructions and used a high quality exterior acrylic paint ( I use Sherwin Williams Superpaint ). The title of the this post is 'Stain A Garage Door' but what it is really about is the mistake homeowners make by staining their garage doors with an oil or solvent based stain and then unbelievably double down on the mistake and use a oil based clear coat over it. The reason all the garage door manufacturers state that using an oil based product will void the warranty is because what happens is after a short period of time, usually only a year or so, the oil based stain product will crack and start to peel off. Now that is bad enough but what happens is because the gel stain or other solvent product has bonded to the original manufacturer's coating, that coating comes off too leaving the bare metal of the door exposed. And it is that fact that voids any warranty on the garage door. One of worst offenders of this is the oil based clear products some people use on a wood painted garage door. I see it several times a year. I'd say about 2-3 times a year I get a call from a home owner that had their garage door painted to look like wood by someone else that didn't know how to go about it and by the time the homeowner has called me the paint job is cracking and peeling off. Sometimes the painter used a regular latex house paint to get the wood effect but then made the huge mistake of using a marine varnish or some other oil clear coat over it. Then it takes about a year depending on sun exposure to start to crack and peel. At that point you either chemically strip the entire surface of the door down or buy a new door. Those are the only two unfortunate options. This is what drives me crazy. There are numerous bloggers out there that have written about creating a wood look on their garage door using gel stain or some other oil/solvent based product. If you look on youtube there are people showing you how to make your garage door look like wood by using the same solvent products. Do not do that. Do not use what they are telling you to use. You can achieve a long lasting and beautiful wood look on a standard garage door by simply using a regular exterior house paint. Easy, right? I have asked homeowners why they put an oil based clear coat on their garage doors or used a solvent stain like gel stain and they tell me that is what the guy at the paint store or big box store told them to use. That also drives me crazy. It is to bad but homeowners get advice from people that they trust to know what they are talking about but it is just not good information. I hope this post will educate the homeowner about the pitfalls of using a stain to make their garage door look like wood. Please feel free to comment on this post or ask me any questions you may have. Like I have said, I have been painting garage doors to look like wood for 10 years. I have had so many people write to me over the years asking for instructions on how to create a wood look on their own door that I finally wrote a tutorial on the subject. 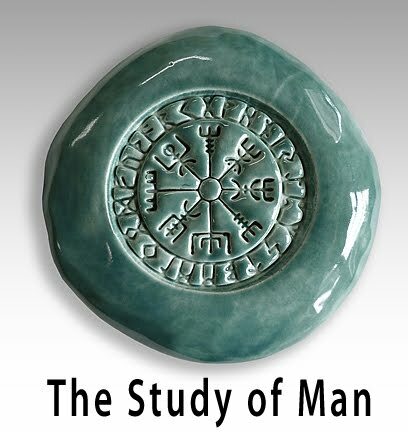 It has 130 some pages and almost 2 hours of videos explaining the process in a methodical step by step manner. You can find out more about it here. Garage Door Tutorial.